Ziad waited 365 days to receive his residency in Norway, a document that millions of refugees and asylum seekers have risked their lives for. In Istanbul, Ziad worked at a hotel near Taksim Square. He started as the housekeeper for a small hotel, earning a monthly wage of 700 Turkish lira, including free accommodation. Most of the money he earned he either saved or sent back to Syria, where his parents and eight siblings lived. When the hotel was at full occupancy, he slept on a wooden board supported by two chairs in the kitchen. “Then I began to invent things,” Ziad says, laughing. “I put two tables together, which I discovered was more comfortable than the board.” When sleeping in the kitchen turned from just one night a week into six or seven, Ziad bought himself a bed. After five months, Ziad was running the hotel – with a little help from the two owners who came and went as they pleased. His salary increased to 1,000 Turkish lira for the extra responsibilities, which included preparing breakfast, taking reservations, working the reception desk, and serving coffee and tea at the hotel’s café. 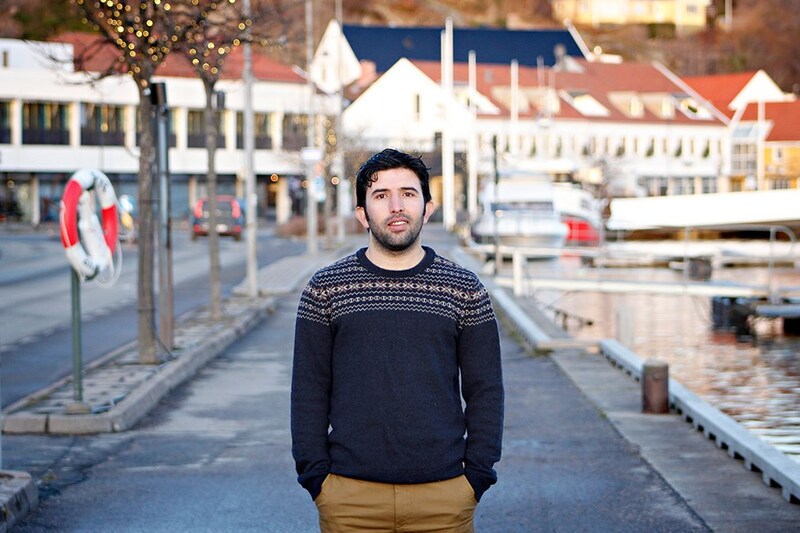 Ziad Al-Taha poses for a photograph in downtown Mandal, Norway, where he has lived for about a year. As I am interviewing Ziad, he tells me a story I have not heard before, and one he is a little embarrassed to tell. One day, he was working alone at the hotel, serving coffee and taking orders while waiting for nargile coals to heat up in the kitchen. Meanwhile, a piece of coal fell, and the kitchen caught fire. “Many of the neighbors blamed my bosses,” Ziad says. “They told them that ‘Ziad was working too hard and alone, and you should have expected something like that to happen. He only has two hands – he cannot do everything by himself.’” Ziad thought they would fire him, but they did not. They asked him to pay 1,500 Turkish lira toward the damage and recruit someone to help him. After hearing this story, I began to understand the complex relationship Ziad had with his employers a little better. Once he saved 3,000 euros, he crossed the Aegean and traveled to Norway via ferry, foot, taxi, bus, and train. The journey took him two weeks. If he left to look for another job, his savings would have dried up quickly, and there was no guarantee that he would find a better opportunity. When he heard of many Syrians working unstable factory jobs for 900 Turkish lira per month, he stopped complaining. Some days he felt lucky, other days he ducked into a free room at the hotel and cried. Eventually, Ziad took on a second job helping out in a third-party cafe in the same hotel. The café’s owner promised him an extra 500 Turkish lira per month, but after just one month the café closed down, and Ziad never received his salary. “He always carried his misbaha (prayer beads) and said Allahu akbar and mashallah,” Ziad says. In the village where Ziad comes from he says that carrying the misbaha means something – it hurt him to feel cheated by a brother in faith. “I could have easily hidden 10 Turkish lira in my pocket everyday, but I didn’t do that, I didn’t want to work that way,” Ziad said. Ziad felt trapped and even, a little disillusioned. He missed having time to talk to his friends and family, who are scattered throughout Syria, Turkey, and Europe. He wanted to finish university, which he put off for years in Damascus to avoid having to join the army. When his Syrian friend living in Norway came to visit Istanbul, Ziad compared their lives and found very few reasons to stay in Turkey. Once he saved 3,000 euros, he crossed the Aegean and traveled to Norway via ferry, foot, taxi, bus, and train. The journey took him two weeks. Ziad Al-Taha waits for a transit paper at a temporary refugee camp on the Greek island of Chios in September 2015. After three months of passing through reception and transit centers, Ziad moved into a house in Mandal, Norway, with five other male asylum seekers. At the reception and transit centers in Norway, food is served cafeteria style, and there is little contact with the outside community. This move was different, as Ziad was now responsible for his own meals and schedule. The house was just like any other in the southern Norwegian town, and his neighbors were Norwegian. At first, he did not know what to do with his newfound freedom, he slept late and ate tuna and sardines until his housemates invited him to share their meals. Eventually, they divvied up the cleaning, shopping, dishwashing, and cooking. Ziad volunteered to be in charge of “housekeeping,” his former expertise. While waiting for a decision to be made on his case, the Norwegian government started paying Ziad 1,465 Norwegian krone every 15 days, which was about the same amount he earned working at the hotel in Istanbul. The salary dropped by 300 Norwegian krone about six months ago, which Ziad and others suspect this was to discourage other migrants from seeking asylum in Norway. Asylum seekers are also given 175 hours of free Norwegian courses while they wait for a decision on their case, although Ziad thinks only 175 hours of a language in a year’s time is not enough and believes the residence permit wait time should determine the number of hours one can study. Up until last year, immigrants received their residency within just a few months of applying, but with the spike in applications, processing times have become much longer. What started as a mantra of not saying ‘no’ to anything inadvertently led to Ziad becoming one of Mandal’s most active volunteers. So, early this year Ziad started looking for other ways to practice Norwegian. He sent a message to the administrator of a Facebook page called “Refugees Welcome to Mandal,” and was invited to come to the local library Monday at five p.m. There, Ziad was introduced to a group of Norwegians who volunteer once a week to help refugees and immigrants with their language skills. Many Eritreans and a few Afghans were there, but very few Syrians. During my visits to Mandal, I witnessed resistance from Arabic speakers to attend events at which there were few other Arabic speakers, and also noticed hostility towards other nationalities from Syrians. When I ask Ziad if Syrians have racist tendencies, he tells me that he thinks all cultures could be more tolerant. I reflect on that and remember a night in Mandal last summer when an Iraqi friend of mine was beaten up by a group of Norwegian men and hospitalized. 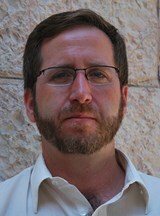 Ziad thrived in this international environment. His English skills helped him to befriend people from several countries, but he kept asking himself, “where are the Syrians?” He started following several local pages on Facebook – the library, shopping center, museums, and charities, and eventually started a page for Arabic speakers in Mandal himself. There, he posted information about free activities and classes in Arabic and soon the library was full of Syrians and Iraqis on Monday nights. The page started with a dozen or so Arabic speakers and now has 377 members – people would even stop him on the street to ask him about upcoming activities. In addition to Mandal’s local library, Ziad discovered two other places offering Norwegian language support. He started attending and made Norwegian friends. One night a couple gave him a ride home and, as a nicety, he invited them in for tea – not expecting them to accept. They surprised him and said yes. As Ziad opened the door, he says he was so nervous about what he would find – his roommate walking around in pajamas, a sink full of dishes, or even worse. Fortunately, the house was clean and empty, and Ziad served his new friends tea. They smoked nargile and played a few games of chess. A few weeks later they invited him to their home for dinner. 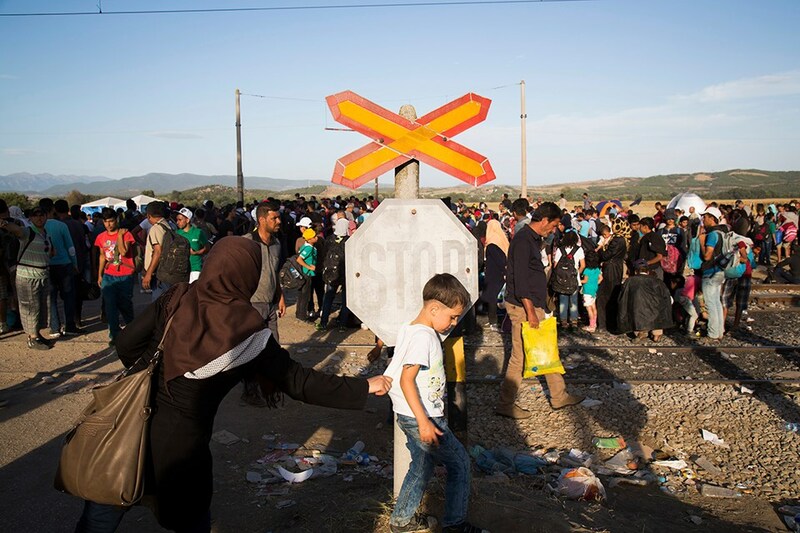 About 5,000 refugees and asylum seekers wait near the Greek border with Macedonia in September 2015. What started as a mantra of not saying “no” to anything inadvertently led to Ziad becoming one of Mandal’s most active volunteers. Not long after his first visit to the library, Ziad helped the Red Cross to open a used clothes shop. Then he became the leader of Norwegian People’s Aid in Mandal and, through one of its projects, opened a café together with other Syrian, Iraqi, and Afghan asylum seekers. They make sweets and Arabic food, serve coffee and tea, and try to create an atmosphere that brings Norwegians and other nationalities together. Most Saturday nights this past summer Ziad donned a bright yellow safety vest and walked the streets of Mandal on a volunteer civilian patrol until the early morning hours. I joined him on duty a few times and witnessed him prevent a fight between two Arabic speakers and then smooth things over with the police officers on the scene. On 1 November 2016, the mayor of Mandal called Ziad to let him know he had won the Årets Mandalitt prize, which is given to one exemplary resident each year. I see Ziad as an evangelist of sorts – always trying to push asylum seekers and refugees to be more involved in the community and boost their public image. 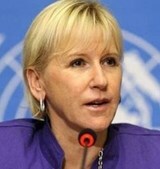 He is well respected, often invited for home-cooked dinners by asylum seekers and Norwegians alike. But playing diplomat and quickly adapting to his new culture sometimes comes with a price, as other asylum seekers have questioned his motives. Once rumors even circulated that Norwegians were paying him. While this upsets me, he does not become flustered easily. He sits with the same people who criticize him, usually over a very sugary cup of tea, and listens to them. I envy his cool head and patience and have witnessed some of his harshest critics become his greatest allies. While his actions may look selfless, Ziad says he is gaining a lot from the lifestyle he has chosen. He has more friends and speaks better Norwegian than most asylum seekers. When others see this, they usually want the same for themselves. 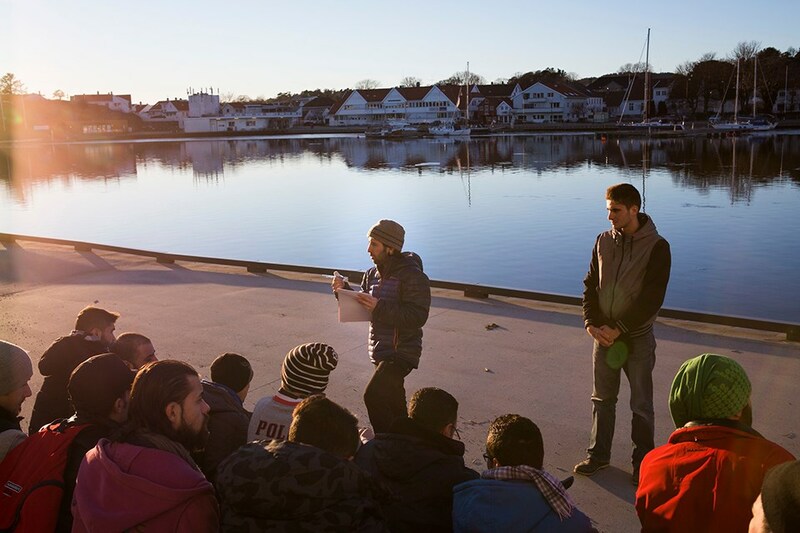 Ziad Al-Taha meets with a group of Syrian refugees and asylum-seekers in Mandal, Norway, to plan a dinner for the community. In late November, Ziad moved into his own home and on the 1st of December started the government’s introduction program that provides provides 600-hour Norwegian language course, as well as professional and cultural training. 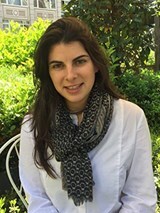 Refugees are given salaries during this period and can stay in the program for up to five years. Ziad estimates he will stay in the program for about a year, until his Norwegian is good enough to apply to a nearby university. There, he plans to study education and become a teacher. Ziad says he has never regretted going to Norway, but surprises me when he tells me that is largely due to his three younger brothers working in Turkey. Because of the income they have been able to earn and send home to Syria, he has not felt bad for not being able to support his family more. 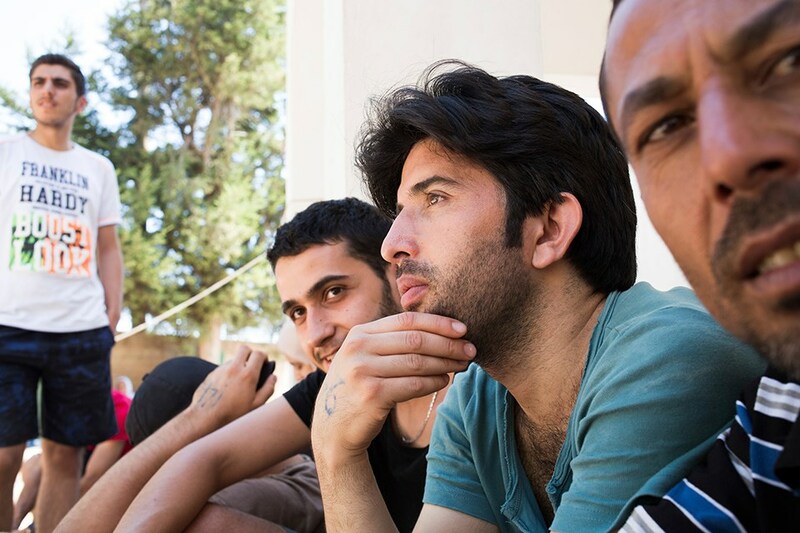 “If it weren’t for my brothers, I could have never left,” Ziad says. Many migrant men in Norway are the principal or sole providers for large families back home in Syria or in Turkey. It is next to impossible for them to send their families money without accepting black market jobs, while those not working black market jobs cannot do anything to help their families. After several months, I have seen this chip away at their psyche, leading to depression and, in some cases, suicide. When refugees become leaders and decision makers in their communities, they can create a safer environment for us all. Immigration is not something new or simple. In the past year I have spent time with hundreds of displaced individuals in Europe – Afghans, Syrians, Iraqis, Somalis, Eritreans, Sudanese, and Iranians. While they do share a common desire for safety, their needs, skills, and dreams could not be more diverse. Many of them have simple and clever ideas for improving their situations that I have never heard being discussed in foreign policy circles. Well-informed policy is made when the population it affects is involved, and both refugees and asylum seekers need more seats at the table. When refugees become leaders and decision-makers in their communities, they can create a safer environment for us all. I often think back to the night that Ziad broke up a fight in Mandal – no one else on patrol that night could have done what he did. The men involved did not see him as an outsider but as one of them, Ziad spoke to them in their language and made them see their foolishness before they did something that could have led to their arrests or – even worse – deportation. 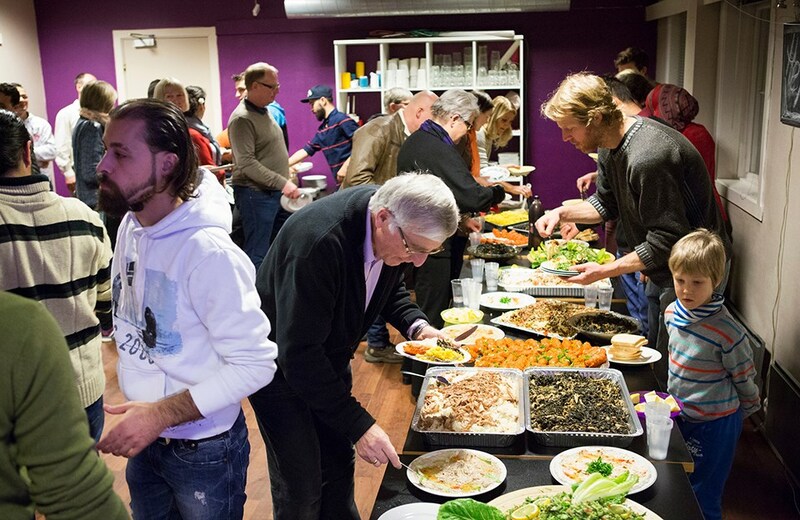 Norwegians try Syrian food at a dinner organized by Ziad Al-Taha and other refugees and asylum-seekers in Mandal, Norway. On November 1st the mayor of Mandal called Ziad to let him know he had won the Årets Mandalitt prize, which is given to one exemplary resident each year. Ziad was shocked and the journalist sitting next to him at the time was on the verge of tears. When he told me, I felt as proud of Mandal as I am of Ziad. It is the first time a refugee has been awarded the honor. According to the UNHCR, 65.3 million people today are displaced by conflict, persecution, and violence. This is more than ever before. My hope is that they too can find home inside themselves. 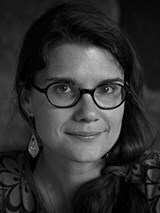 Elie Gardner is a freelance photographer and filmmaker based in Istanbul.